NATURAL HABITAT AND PREFERRED SITE: Native to the eastern United States from the Gulf of Mexico to Canada. 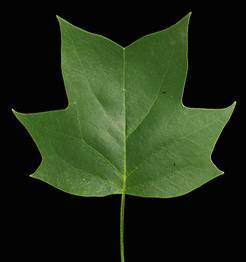 Tulip tree grows in the rich moist soils of Louisiana, Arkansas eastward to Florida and northward all the way to the northeast part of the United States up the East Coast. It will grow in Texas, especially in the deep soils, although it does have a little trouble in the heat of the summer. IDENTIFICATION INFORMATION: Straight-trunked, smooth-barked tree with leaves shaped like tulips. 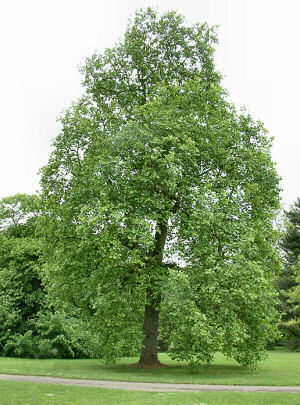 Large-growing, good-looking tree from an overall and textural standpoint, generally a single trunk, interesting leaves and yellow fall color. Capable of becoming huge, has brittle wood. FLOWERS AND FRUIT: Flowers bloom in April and May, male and female parts in the same perfect flowers, 2 to 5 inches across and cup shaped. They are green on the outside with an orange- yellow center. They face upward and are not showy from the ground but attractive close up. Fruit is a dry cone-like structure which matures in the fall September to October and contains numerous woody brown scales 2 to 3 inches long, many seeds. Flowers usually don’t form until the tree is at least 10 to 12 years old although this is accelerated in an organic program. BARK: Smooth, light brown to gray becoming heavier textured with age. CULTURE: Fairly easy to grow in Texas especially in the deep, acid, sandy soils. It has a little trouble above rock, especially the limestone rocks of North and Central Texas, but responds well to the organic fertilization program and consistent moisture. PROBLEMS: Chlorosis and foliage burn in the heat of the summer causing leaf drop. Relatively few insect and disease problems. PROPAGATION: By seed primarily although the plant can also be propagated by budding, grafting or layering. 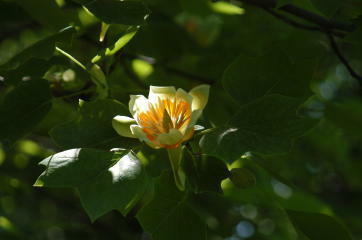 INSIGHT: Tulip tree, because of its thin bark, is easily damaged by fire. Not a good tree to plant often in Texas but a few here and there are interesting.